The image below depicts paronychia. 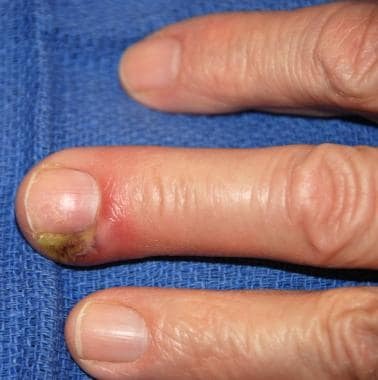 Classic presentation of paronychia, with erythema and pus surrounding the nail bed. In this case, the paronychia was due to infection after a hangnail was removed. The acute infection, which is painful and purulent, is most frequently caused by staphylococci, although it commonly has mixed aerobic and anaerobic flora. The patient's condition and discomfort are markedly improved by a simple drainage procedure. Chronic paronychial infections are usually fungal, rather than bacterial, in nature (see the images below). 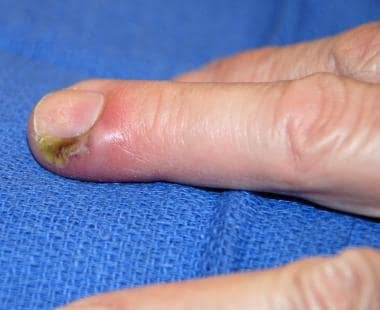 In this case of paronychia, no pus or fluctuance is involved in the nail bed itself. Paronychia is the most common hand infection in the United States, representing 35% of these disorders. The infection is more common in women than in men, with a female-to-male ratio of 3:1. According to the report, the results suggest that quality of life is influenced more by the effect of a nail disease on the appearance of the nail than it is by the actual severity of the disease. The nail organ is an integral component of the digital tip. It is a highly versatile tool that protects the fingertip, contributes to tactile sensation by acting as a counterforce to the fingertip pad, and aids in peripheral thermoregulation via glomus bodies in the nail bed and matrix. Because of its form and functionality, abnormalities of the nail unit result in functional and cosmetic issues. The anatomy of the nail complex is shown in the image below. The nail is longitudinally flanked by 2 lateral folds, or perionychium. Proximally, it is covered by the eponychium. Distal to the perionychium, the region immediately beneath the free edge of the nail is the hyponychium. The hyponychium serves as a tough physical barrier that resists bacterial infection. Depicted are the nail fold (A), dorsal roof (B), ventral floor (C), nail wall (D), perionychium (E), lunula (F), nail bed (G), germinal matrix (H), sterile matrix (I), nail plate (J), hyponychium (K), distal groove (L), fascial septa (M), fat pad (N), distal interphalangeal joint (O), and extensor tendon insertion (P). The white, crescent-shaped opacity at the proximal end of the nail is the lunula, which is the visible portion of the germinal matrix. The whiteness of the lunula is due to the poor vascularity of the germinal matrix. The nail arises from a mild proximal depression called the nail fold. 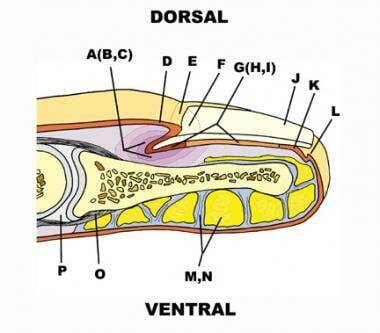 The nail divides the nail fold into 2 components: the dorsal roof and the ventral floor, both of which contain germinal matrices. The skin overlying the nail fold is called the nail wall. The nail bed receives its blood supply from the 2 terminal branches of the volar digital artery. A fine network in the proximal nail bed and in the skin proximal to the nail fold of the finger provides venous drainage. Lymphatic drainage follows a course similar to that of the venous network. The lymphatic network is dense in the nail bed, especially in the hyponychium. Innervation is derived from the trifurcation of the dorsal branch of the volar digital nerve. One branch goes to the nail fold, one to the pulp, and one to the distal tip of the finger. Paronychia, whether acute or chronic, results from a breakdown of the protective barrier between the nail and the nail fold. The occurrence of cracks, fissures, or trauma allowing organisms to enter the moist nail crevice leads to bacterial or fungal (yeast or mold) colonization of the area. Early in the course of this disease process (< 24 h), cellulitis alone may be present. An abscess can form if the infection does not resolve quickly. Paronychial erythema and edema with associated pustule. This suggests a bacterial etiology. Therefore, benign and malignant neoplasms should always be excluded when chronic paronychia does not respond to conventional treatment. Chronic paronychia most often occurs in persons whose hands are repeatedly exposed to moist environments or in those who have prolonged and repeated contact with irritants such as mild acids, mild alkalis, or other chemicals. People who are most susceptible include housekeepers, dishwashers, bartenders, florists, bakers, and swimmers. In addition, individuals who are immunocompromised, such as those with human immunodeficiency virus (HIV) infection or those undergoing steroid therapy, are predisposed to paronychia. Other conditions associated with abnormalities of the nail fold that predispose individuals to chronic paronychia include psoriasis, mucocutaneous candidiasis, and drug toxicity from medications such as retinoids, epidermal growth factor receptor inhibitors (cetuximab) (tyrosine kinase inhibitors [neratinib, afatinib]), [13, 14] and protease inhibitors. [15, 16] Of particular interest is the antiretroviral drug indinavir, which induces retinoidlike effects and remains the most frequent cause of chronic paronychia in patients with HIV disease. Instruct individuals to avoid any trauma to the fingernails and to avoid nail biting and finger sucking. Educate patients who work with their hands in a moist environment that such exposure predisposes them to infections. Inform patients that treatment is unlikely to be successful if their exposure to a moist or wet environment is not changed. Explain to patients who are immunocompromised that they must remain vigilant against any minor trauma to the fingertips and nails. For patient education information, see the Skin Conditions and Beauty Center, as well as Paronychia (Nail Infection) and Nail Psoriasis. Marx J, Hockberger R, Walls R, eds. Hand. Rosen's Emergency Medicine: Concepts and Clinical Practice. 8th ed. Philadelphia, Pa: Saunders; 2013. 534-70. Rigopoulos D, Larios G, Gregoriou S, Alevizos A. Acute and chronic paronychia. Am Fam Physician. 2008 Feb 1. 77(3):339-46. [Medline]. Rockwell PG. Acute and chronic paronychia. Am Fam Physician. 2001 Mar 15. 63(6):1113-6. [Medline]. Roberts JR, Hedges JR, eds. Incision and Drainage. Clinical Procedures in Emergency Medicine. 6th ed. Philadelphia, Pa: Saunders; 2013. 719-58. Tosti A, Piraccini BM, Ghetti E, Colombo MD. Topical steroids versus systemic antifungals in the treatment of chronic paronychia: an open, randomized double-blind and double dummy study. J Am Acad Dermatol. 2002 Jul. 47(1):73-6. [Medline]. Brook I. Aerobic and anaerobic microbiology of paronychia. Ann Emerg Med. 1990 Sep. 19(9):994-6. [Medline]. Belyayeva E, Gregoriou S, Chalikias J, Kontochristopoulos G, Koumantaki E, Makris M, et al. The impact of nail disorders on quality of life. Eur J Dermatol. 2013 Jun 28. [Medline]. Chronic paronychia: what you should know. Am Fam Physician. 2008 Feb 1. 77(3):347-8. [Medline]. Fowler JR, Ilyas AM. Epidemiology of adult acute hand infections at an urban medical center. J Hand Surg Am. 2013 Jun. 38(6):1189-93. [Medline]. van Diepeningen AD, Feng P, Ahmed S, Sudhadham M, Bunyaratavej S, de Hoog GS. Spectrum of Fusarium infections in tropical dermatology evidenced by multilocus sequencing typing diagnostics. Mycoses. 2015 Jan. 58 (1):48-57. [Medline]. Bahunuthula RK, Thappa DM, Kumari R, Singh R, Munisamy M, Parija SC. Evaluation of role of Candida in patients with chronic paronychia. Indian J Dermatol Venereol Leprol. 2015 Sep-Oct. 81 (5):485-90. [Medline]. Masago K, Irie K, Fujita S, Imamichi F, Okada Y, Katakami N, et al. Relationship between Paronychia and Drug Concentrations of Epidermal Growth Factor Receptor Tyrosine Kinase Inhibitors. Oncology. 2018. 95 (4):251-256. [Medline]. Hamid RN, Ahn CS, Huang WW. Adverse Cutaneous Effects of Neratinib. J Dermatolog Treat. 2018 Oct 15. 1-8. [Medline]. Tomková H, Kohoutek M, Zábojníková M, Pospísková M, Ostrízková L, Gharibyar M. Cetuximab-induced cutaneous toxicity. J Eur Acad Dermatol Venereol. 2010 Jun. 24(6):692-6. [Medline]. Coquart N, Karam A, Metges JP, Misery L. [Topical steroids in the treatment of paronychia induced by the epidermal growth factor receptor inhibitor cetuximab]. Ann Dermatol Venereol. 2010 Apr. 137(4):306-7. [Medline]. Pietkiewicz P, Bowszyc-Dmochowska M, Gornowicz-Porowska J, Dmochowski M. Involvement of Nail Apparatus in Pemphigus Vulgaris in Ethnic Poles Is Infrequent. Front Med (Lausanne). 2018. 5:227. [Medline]. Toki S, Hibino N, Sairyo K, Takahashi M, Yoshioka S, Yamano M, et al. Osteomyelitis Caused by Candida glabrata in the Distal Phalanx. Case Rep Orthop. 2014. 2014:962575. [Medline]. [Full Text]. Canales FL, Newmeyer WL 3rd, Kilgore ES Jr. The treatment of felons and paronychias. Hand Clin. 1989 Nov. 5(4):515-23. [Medline]. Eames T, Grabein B, Kroth J, Wollenberg A. Microbiological analysis of epidermal growth factor receptor inhibitor therapy-associated paronychia. J Eur Acad Dermatol Venereol. 2010 Aug. 24(8):958-60. [Medline]. Osio A, Mateus C, Soria JC, Massard C, Malka D, Boige V, et al. Cutaneous side-effects in patients on long-term treatment with epidermal growth factor receptor inhibitors. Br J Dermatol. 2009 Sep. 161(3):515-21. [Medline]. Gilbar P, Hain A, Peereboom VM. Nail toxicity induced by cancer chemotherapy. J Oncol Pharm Pract. 2009 Sep. 15(3):143-55. [Medline]. Rigopoulos D, Gregoriou S, Belyayeva Y, Larios G, Gkouvi A, Katsambas A. Acute paronychia caused by lapatinib therapy. Clin Exp Dermatol. 2009 Jan. 34(1):94-5. [Medline]. Kapellen TM, Galler A, Kiess W. Higher frequency of paronychia (nail bed infections) in pediatric and adolescent patients with type 1 diabetes mellitus than in non-diabetic peers. J Pediatr Endocrinol Metab. 2003 Jun. 16(5):751-8. [Medline]. Colson AE, Sax PE, Keller MJ, Turk BK, Pettus PT, Platt R, et al. Paronychia in association with indinavir treatment. Clin Infect Dis. 2001 Jan. 32(1):140-3. [Medline]. Tosti A, Piraccini BM, D'Antuono A, Marzaduri S, Bettoli V. Paronychia associated with antiretroviral therapy. Br J Dermatol. 1999 Jun. 140(6):1165-8. [Medline]. Dahdah MJ, Scher RK. Nail diseases related to nail cosmetics. Dermatol Clin. 2006 Apr. 24(2):233-9, vii. [Medline]. Yip KM, Lam SL, Shee BW, Shun CT, Yang RS. Subungual squamous cell carcinoma: report of 2 cases. J Formos Med Assoc. 2000 Aug. 99(8):646-9. [Medline]. Daniel CR 3rd. Paronychia. Dermatol Clin. 1985 Jul. 3(3):461-4. [Medline]. Jules KT, Bonar PL. Nail infections. Clin Podiatr Med Surg. 1989 Apr. 6(2):403-16. [Medline]. Muñiz AE, Evans T. Chronic paronychia, osteomyelitis, and paravertebral abscess in a child with blastomycosis. J Emerg Med. 2000 Oct. 19(3):245-8. [Medline]. Turkmen A, Warner RM, Page RE. Digital pressure test for paronychia. Br J Plast Surg. 2004 Jan. 57(1):93-4. [Medline]. Giacomel J, Lallas A, Zalaudek I, Argenziano G. Periungual Bowen disease mimicking chronic paronychia and diagnosed by dermoscopy. J Am Acad Dermatol. 2014 Sep. 71(3):e65-7. [Medline]. Engineer L, Norton LA, Ahmed AR. Nail involvement in pemphigus vulgaris. J Am Acad Dermatol. 2000 Sep. 43(3):529-35. [Medline]. Patsatsi A, Sotiriou E, Devliotou-Panagiotidou D, Sotiriadis D. Pemphigus vulgaris affecting 19 nails. Clin Exp Dermatol. 2009 Mar. 34(2):202-5. [Medline]. Fung V, Sainsbury DC, Seukeran DC, Allison KP. Squamous cell carcinoma of the finger masquerading as paronychia. J Plast Reconstr Aesthet Surg. 2010 Feb. 63(2):e191-2. [Medline]. Connolly JE, Ratcliffe NR. Intraosseous epidermoid inclusion cyst presenting as a paronychia of the hallux. J Am Podiatr Med Assoc. 2010 Mar-Apr. 100(2):133-7. [Medline]. Pabari A, Iyer S, Khoo CT. Swiss roll technique for treatment of paronychia. Tech Hand Up Extrem Surg. 2011 Jun. 15(2):75-7. [Medline]. Shaw J, Body R. Best evidence topic report. Incision and drainage preferable to oral antibiotics in acute paronychial nail infection?. Emerg Med J. 2005 Nov. 22(11):813-4. [Medline]. [Full Text]. Bowling JC, Saha M, Bunker CB. Herpetic whitlow: a forgotten diagnosis. Clin Exp Dermatol. 2005 Sep. 30(5):609-10. [Medline]. Gmyrek R, Dahdah M. Local anesthesia and regional nerve block anesthesia. Medscape Drugs & Diseases. Available at http://emedicine.medscape.com/article/1127490-overview. July 7, 2015; Accessed: November 30, 2015. Daniel CR 3rd, Daniel MP, Daniel J, Sullivan S, Bell FE. Managing simple chronic paronychia and onycholysis with ciclopirox 0.77% and an irritant-avoidance regimen. Cutis. 2004 Jan. 73(1):81-5. [Medline]. Simple acute paronychia can be drained by elevating the eponychial fold from the nail with a small blunt instrument such as a metal probe or elevator. After simple drainage, there is purulent return. Wound opened with a small incision using a number-11 blade scalpel. The wound can be explored with a blunt probe, clamps, or the blunt end of a cotton swab. Ensure that all loculations are broken up and that as much pus as possible is evacuated. Prior to packing or dressing the wound, irrigate the wound with normal saline under pressure, using a splash guard, eye protection, or both. The wound can be covered with antibiotic ointment or petroleum jelly to prevent bandage adhesion. Disclosure: Partner received grant/research funds from Genentech for none.